What would you do if you knew you could? 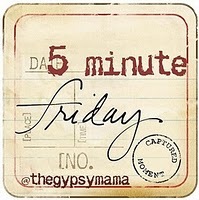 That’s today’s prompt for The Gypsy Mama’s Five Minute Friday exercise, and it nearly stumped me! I was tempted to pass this week, but then I realized the point of writing freely for five minutes on a topic, without edits, isn’t to have something figured out. It’s to see what you might uncover through the struggle. So here goes it. Ten years ago, there would have been all kinds of things I might have put on a list of things I would do, if I knew I could—start a business, live happily alone, single parent, navigate Chicago and New York solo, buy a house and take care of it on my own, play in a band, start a blog, publish an essay in a book, knit a sweater I actually want to wear, let go of the hurt in my past. Now, I’ve done all of those things, and it’s hard to think of anything I would do if I knew I could. There are many things I still want to do, but I already know I can, if I make the time. Maybe it sounds strange (and a bit cocky? ), but I feel so capable. Now the issue is all about prioritizing—sorting through those goals and pinning down the motivations behind them. Are these things I want to do to prove something? Do they make me a stronger person? A better wife, mom, friend, writer? Do they bring me closer to God? Or do they just feed my ego? Do I think that if I do these things I will gain worth in the eyes of the world? Is that what I want? I have a friend who is working toward running a marathon some day. She’s doing half-marathons now. Would I run a marathon if I could? Sure, because then I’d be the sort of person who *wants* to run a marathon. If I decided that was something I wanted to do, could I make it happen? Sure. But it’s not. I know that my goals have to be tied to who I am—the life I was created to live out. Tagged as: acceptance, capable, dreams, ego, five-minute-friday, goals, motivation, priorities, want, wholeness, why? Write a book. Because the essay I’m working on right now has enough material to start to be one. And I’m so in love with the subject matter that I was up past 11 last night double checking dates as I build my time line of how things happened in this woman’s life. No, I’m not telling who. Ah no – not cocky in the least. Rather – enviably self-aware, asking exactly the right questions and living YOUR life fully. LOVE this. Thanks so much. i love the wisdom in this! you encourage me, friend. After all you’ve gone through and accomplished, it makes sense to feel capable of anything. But being aware and having priorities is very wise. All of your daily written introspections have made you into a very wise woman, indeed! If my body would allow me (which it doesn’t), I would go on one of those wonderful bike trips along the rivers in Europe for 14-18 days. I can totally imagine myself loving that. Diana, thank you for saying that. I’ve felt a great sense of peace since I reached this place of being at home in myself, and trusting my abilities. It sure took a long time to get there! When I first got to college, I was too unsure of myself to join the student newspaper staff, even though I was a journalism minor and had been the editor of my high school’s very article-heavy yearbook. I lived many, many years not at all sure that I could do any of the things I wanted to do. suzannah, I’m definitely thinking this is the best part about getting older—gradually becoming more wise and sure of who you are. I’m glad we can share our wisdom and encourage each other. Jen, yes, the book is next. I’m sure that was most prominently on my mind as I wrote this post—I know I can write a book, but can I set aside other important things to make it happen? Joi, now that sounds like a wonderful thing to do! And I know that when you have a true barrier, like a chronic illness, you aren’t just making excuses for why you aren’t doing certain things. I wonder if there’s a way to take that dream and amend it into something more manageable, though? I would quit my job. If I knew we could figure out how to maintain our livelihood the way it is now without the salary from my current job, I’d do it in a heartbeat. There are other things I know I’m capable of that I just need to DO. Like write the book that’s been in my head for over five years. But it is a matter of deciding that’s something I want to focus my energy on.